For those of you that know me, know we recently went through “reptile decision day” To make a long story short, my son wanted an exotic reptile as a pet– we got a turtle. The decision day was his birthday and Iggy arrived a few days later. This card was for the “thank you” notes for all of his birthday gifts and money. Can you believe that in all my stamps this is the only turtle I have? Its from Close to my Heart’s (CTMH) Lazy Days set. The card stock is also CTMH (topiary). 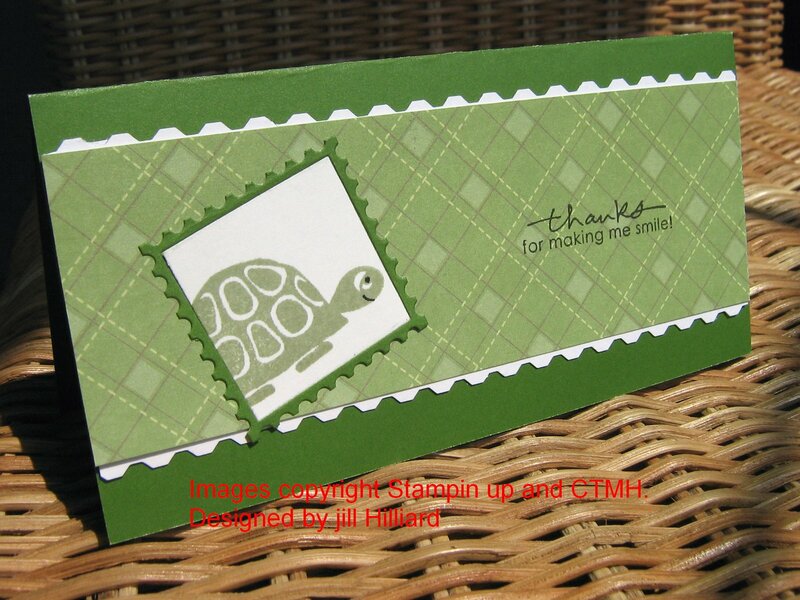 I am not sure who makes the patterned paper and the postage stamp is from a cuttlebug die cut. The card is 6×3 and fits into the smaller business size envelopes. Simple enough for a 9yr old Turtle owner. He liked them!